I am a big fan of dark florals all year round. They’re sophisticated without being staid, and they lend themselves well to pattern mixing. All this by way of saying: I forgot to choose a new Karina Dress for January’s First Monday Giveaway! So I am repeating one of my favorites, the Rita in Navy, and I updated it for the cooler weather. The Rita dress is always smooth and easy to wear and accessorize. As with all Karina dresses it’s made with love in Brooklyn, USA. I can crush it into a ball in an overnight bag and it looks perfect the next day. It’s never seen a dry cleaner’s door – always machine wash and hang to dry. I like the pinstripes with the dark graphic dress. 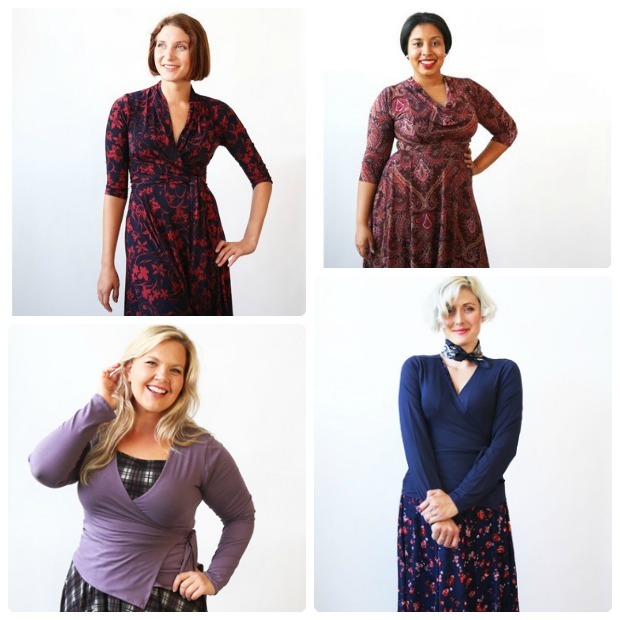 Gorgeous Karina dresses – there’s mine on the upper left – for all ages, shapes and sizes. Today I felt like Doc Martens (sim) on my feet – an edgy counterpoint to my ladylike dress. Actually Docs go with everything, and these are worn regularly with dresses or jeans. The pearl and tassel necklace (sim) is thrifted, as is the Tahari suit jacket (sim). Somehow the trousers to the suit have shrunk and had to go to the charity shop. That shrinking trouser thing has to be addressed. I want to join the fun and always need a new dress! Pingback: Powers the Flower: A New Link-Up | it's all FINE. WHATEVER tickles the fancy. I just found your blog! I am really looking forward to future posts! Patti, just wanted to let you know that I have a post coming out tomorrow that will have a link back to this article as well as a new link-up. I hope you don’t mind the mention and will take a minute or two to read the post. The boots are ever so good with the dress. Indeed they make the dress modern and less ladylike. Good thinking. I am going to join Visible Monday (finally found some time), but I will link to it next Sunday. OK? Because a lot of my readers have already read my post of last Sunday. So it doesn’t feel fare to add a link to Visible Monday now. Beautiful dresses! I’ve always wanted a Karina Dress! All I know is my wife wouldn’t mind receiving one free and elegant dress! Thanks for the chance to win it! I would love to win of these dresses, and you rock, girl! i love the dark florals trend and this dress suits you sooooo well! What a beautiful winter look!! Love how you put together your outfit! Great print on the dresses! Love the dark floral dress paired with the Doc Martens. Perfection!! I have yet to try a Karina dress, but I have yet to see one that’s not universally flattering. This one is no exception. Love the print . great looks! love your outfits! I love their dresses. Especially the Katharine dress. What a beautiful winter look…love this dress!!! 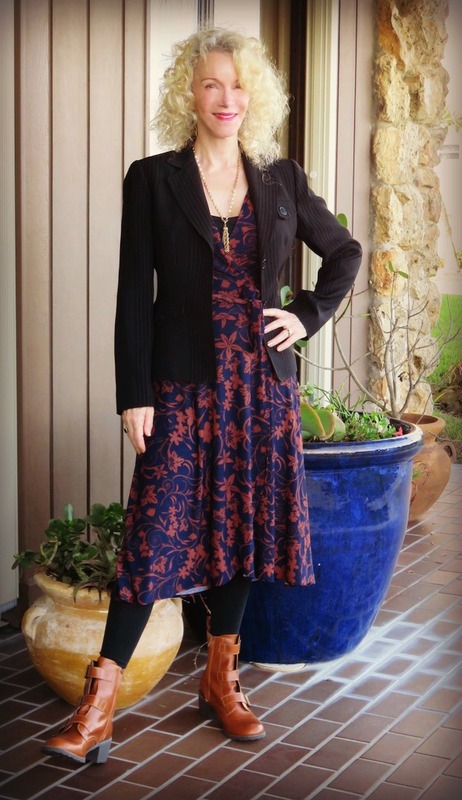 Great dress and perfect boots, Patti! Happy New Year to you! I love the Karina dress any way that you style it! Thank you for the chance to win one! Happy New Year and I lok forward to your posts! I love the way you updated it for winter! Great outfit. And it looks fabulous on you! I also like dark floral dresses… Good luck everyone! Patti you rock this look. Chunky boots and a feminine dress are always so contemporary on you. I love this dress on you. Love the pattern in rust, looks wonderful. I had gone to the Karina site recently and this was a favorite. Great boots too!! Perhaps the shrinking trousers could be worn under the ensemble as bloomers? Or did they shrink the other way – nasty things? Nevertheless you do look smashing. Thanks as always, for having us Visible on Mondays. Hi Patti! Happy New Year ! I love the Docs with the dress – comfortable with an edge ! I do adore that dress. I’d own one but it was already sold out. Great styling with the chunky boots and tasselled necklace Patty. You can never go wrong with florals. Boots and dress are a wining combination when there is snow on the ground! You look great in dark florals Patti. I love florals, but need to incorporate more in my wardrobe. Always relieved to get back to normal, and I’m looking forward to the new year. I wish you all the best! Thank you for hosting. Soooooooooooooooooooooo very glad to be back to normal. You look great in moody florals Patti – Happy New Year! I agree about dark florals. They are year-round. Nice dress. I have wanted one of those Karina dresses in a long while. Hope to win one. You know I love this Patti! Nothing better than a pretty feminine dress and tough girl boots. Another fab Karina dress! I have worn the one I won from you lots, and indeed it does seem to spring back to life magically after being packed, folded, rolled, squashed or crumpled – amazing! Love the Docs with yours – you can never go wrong with that. What a great start to the year, Patti. I too, am another fan of dark florals. There’s just something very sophisticated about them. Light florals are lovely but they can veer into tweedom in a way that dark florals never seem to do! And the pinstripe jacket and boots are fabulous teemed with the dress. Wonderful styling. Lovely pairing with a structured jacket and chunky boots, Patti! Thank you for the link-up! I do love wearing dark floral too. Love this dress paired with the boots. A floral dress and boots are my favorite outfit. Add a sweater or jacket, and I’m good to go for almost anything. Beautiful print! I really like such types of easy-to-care dresses. I like the way you styled the dress. You have amazing footwear! Such a gorgeous print. Happy New Year, Patti! Everyone looks so gorgeous! You look wonderful in your Karina dress, Patti! Thank you so much for hosting Visible Monday! I always love rugged boots with a floral dress! I think I spent the 90s in that look and I’m so excited that it’s back in fashion! Thanks for the link up & the giveaway! Happy New Year Patti. Loving your dress and boots. Thanks for hosting yet another fabulous party. Lets just say I would gladly wear every single item you have on today. I absolutely love this ensemble and I totally agree, dark florals are a great way to go, even in the cold of winter. Pairing this dress with the Doc’s, spectacular! Happy New Year! I was thrilled to win the dress last month!! I can’t wait to do a post on it! Thank you so much! What a GREAT floral dress Patti!! you know how to rock a wrap dress better than anyone I know!! And Lovin’ the boots!!! Happy New Year gorgeous!! Starting the year with a giveaway…how much fun is that! Thanks for the link up Patti. You look great in dark florals! I really like the dress with the boots! Great look! I’ll add my link to the linkup tomorrow. Oh dear, Patti – the shrinking trousers are a direct result of global warming! This is alarming. Love your dress with the Docs and tassels. Yes, coming here DOES cure a hangover. Thank you! Happy New Year, Patti! This look is ultra cute for you. I love the floral dress, paired with the classic blazer, and of course, your signature, quirky boot. Fun! Oh I wish boots and a dress suited me, Patti – I LOVE the look but it just doesn’t look right on me!! The DMs are the bee’s knees, such a good colour and style and of course they’re the perfect contrast for a classic floral dress. Thank you for hosting, wishing you a very HNY and see you at #iwillwearwhatilike tomorrow (I hope)! Guess I am a boots and dress kind of gal this week too. I like florals as long as they aren’t too large and overwhelm me. Many thanks for hosting this linkup into the New Year and beyond! Happy New Year, Patti! A good dress is always worth repeating, and this one is certaily pretty. Thank you for hosting all of us every week – it is the ‘funnest’ part of the week!! I know your new year will be wonderful & I wish all good things for you.